Step 4: Cut a bunch of ribbon pieces and tie on the handle to spice things up a bit. Very cool! 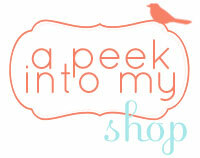 I love how you are so open and honest about your faith on your blog! It is really a great way to reach people. Thanks! I like this idea. I have used paper in a container, but this is more sturdy with little hands. We just started a 27 day Fruits of The Spirit "quest". We work on the "fruits" (love, joy, peace, patience...)for three days each and at the end of the 27 days, we will have a PaRtY! This is wonderful! I'm going to do this with my kids! When I was little we had a bowl with all our prayer requests in it and we would each get to pick one out a supper time too. 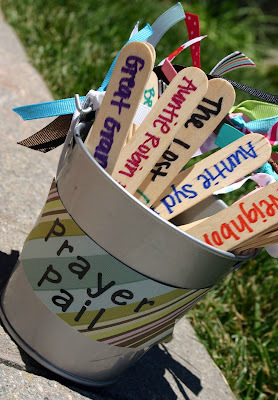 I don't know why we haven't started this with our kids yet, but now, after seeing your cute 'prayer pail' we most certainly will! I love your blog. I'm an old friend of Aaron (I used to work at Saddleback). Thanks for this post! I'm going to try to make one of these. Love this idea. Definitely one I will do with my kids! I Love this Idea. And it would even be great as a "centerpiece" for the table. I can't wait to do this project with my daughter, and then share it with my readers. I’ll be sure to link to this post too. I saw this same idea in a book a few years ago. I include pictures of the things or people on the sticks. 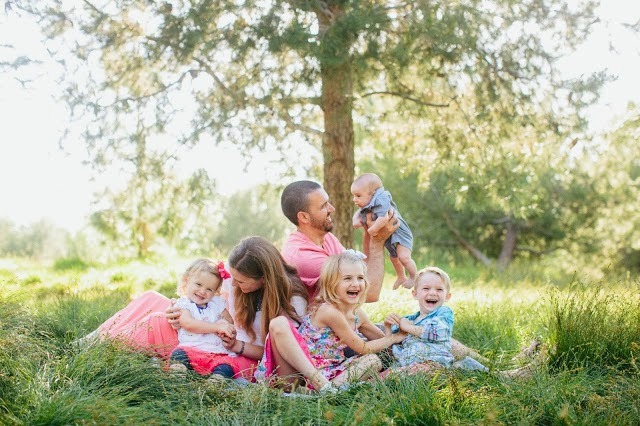 It has made family and personal prayer times more meaningful and thoughtful for my family. Thank you!!! So excited to do this with my kids that are now old enough to help write out their OWN prayers and "thanks to God" on a stick. I LOVE this. I have been wanting a practical way to live out our faith in our home. And my girls love crafts. Hi - found this on Pinterest and love it. I made it today with the kids giving input on who they wanted on the sticks. Thanks!! Found this on Pinterest and LOVED it! I no longer have little kids as mine have all grown, but I have friends who can use this idea and I'm excited to pass it along. Thanks for sharing! I just saw this on Pinterest and I want to thank you (and whoever 'Pined' this). What a wonderful idea! Prayer and the things/people we pray for can seem so abstract to children, this gives them something concrete to use to help make that connection. Thank you again! I am going to make one right now with a Mason Jar that I have in the pantry! I found this from pinterest and love it! I am thinking about making a LENT pail. Our children's church has been doing a unit on how to pray this month and this is what we will be making as a group tomorrow morning as the culmination of our unit. What a fun (and easy and adorable) way to teach kids how to pray! I just found your blog and Prayer Pail post through Pinterest. I love, love, love this idea! I just linked your blog in my post about teaching our children about prayer: http://turning-our-hearts.blogspot.com/2012/02/teaching-our-children-to-pray.html. Thank you for sharing! 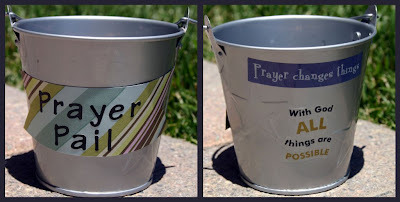 I know this an old post, but I was searching for prayer pail/pot ideas tonight and came across yours. I love it! I can't wait to make them with my kids! I will try this with my class, but, I think I'll use plastic tumbler cups ( dollar tree). This way it's a bit faster project and the kids can use Sharpies to decorate the cups themselves. I'll punch a hole on either side of the cups as well and add ribbon. Great idea! I am going to use this with our Girls' Club work in Albania! 0802jejeLe Mark nike wmns air max 1 pas cher I était un knuckleduster de air jordan en soldes fonte-bronze. Cela signifie Jordan 5 enfants que vous avez déterminé nike air zoom pegasus 34 soldes que vous aurez air jordan en promotion besoin d'une nouvelle série de asics tiger baskets gel kayano evo noir baskets pour le nike internationalist kaki femme basketball. My WOM at Pritchard Memorial Baptist Church in Charlotte, NC did this September 2018. The only thing that we different was, added all the Missionary’s name for the month of July and August, because we do not meet during the summer. So each prayer pail 31 missionaries name. All of the 44 prayer pails had one single name no doubles in any pail. So every Missionary was prayed for even if we missed their birthday. It’s was greatly received by all the ladies.